Mark Bruckert, a sophomore at the Crooms Academy of Information Technology and a member of the Oviedo Historical Society, recently installed his Eagle Scout project at the Lawton House Museum in Oviedo. The installation of iPads allows visitors to the Lawton House to connect to Oviedo artifacts stored in the RICHES Mosaic Interface database, as well as items in Florida Memory, the Florida Historical Society, and DiaryEarth. In 2017, Bruckert presented his project plan to enhance the Lawton House patron experience by providing access to digital archives through the installation of iPads. Acting on the plan, he raised the funding needed to purchase two iPads and the materials to construct two wooden pedestals for displaying the tablets by holding a car wash with the assistance of his Boy Scout troop. He worked with a master carpenter to design and construct pedestals that reflect the period in which the house was constructed. 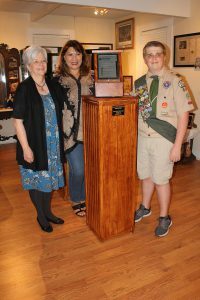 Finally, with the assistance of his mother, Jean Bruckert and Oviedo Historical Society President Dawn Jensen, Bruckert installed the pedestals. Becoming an Eagle Scout is a rigorous process that requires the earning of at least 21 merit badges and an extensive service project that the Scout plans, organizes, and manages. Since its inception in 1912, some two million Scouts have achieved the rank of Eagle Scout, representing only about six percent of all Boy Scouts. The Oviedo Historical Society collection in RICHES represents the multiple phases of a lengthy partnership and the opportunities for collaboration between faculty, students and the public. In 2015, the Introduction to Public History graduate symposium collaborated with Oviedo Historical Society on a semester-long project that culminated with a History Harvest. A third partner in the project, Easy Photo Scan, provided technical assistance on the day of the harvest. The harvest gained sixteen oral histories and more than 500 scanned items from personal and organizational collections which were added to the RICHES database. Porsha Dossie, a 2018 MA in Public History Graduate, created a digital exhibit on the history of the black experience in Oviedo for the RICHES site. The Oviedo collection can be viewed here.